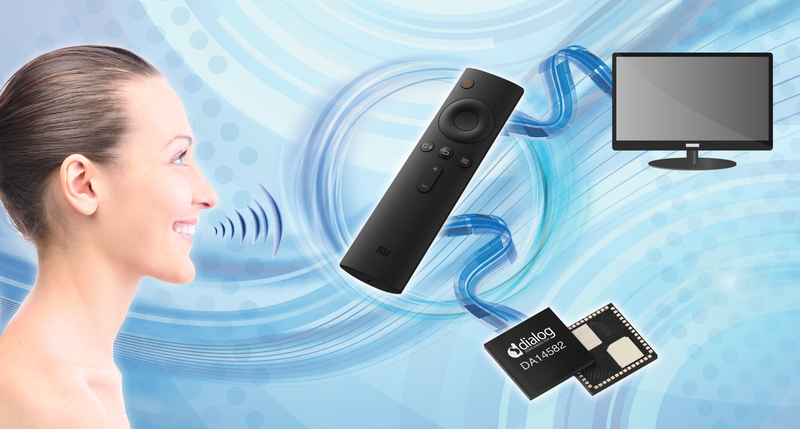 Dialog Semiconductor’s SmartBond DA14582 Bluetooth SoC is at the heart of Xiaomi’s new Mi Bluetooth Voice Remote Control. Xiaomi introduced the remote control unit (RCU) at the recent launch of its Mi Tv3, 60-inch smart TV and Box3 OTT set-top box. The voice RCU, which can be used with both TVs and set top boxes, enables fast, responsive search and control of many of the television’s functions, including those involving web browsing and gaming. It eliminates the need for complex controls and menus, greatly improving the user experience. The unit retails for 99RMB. Approximately 450 million wireless remote controls will ship by 2018, according to analyst IHS. Bluetooth wireless technology will replace infrared remotes by enhancing the user experience through smart features including voice commands and motion recognition, and the widespread Bluetooth presence in consumer IoT devices. The DA14582’s industry-leading power saving techniques extends the battery lifetime of Xiaomi’s voice RCU which can deliver 500 hours for typical gaming applications or 140 hours of audio recording from the compact unit’s battery. The Dialog SoC integrates a radio transceiver, Bluetooth Smart baseband processor running on an ARM Cortex M0 core, and an analogue wide-band audio codec. Its high level of functional integration minimises the bill-of-materials for the Xiaomi RCU. The high performance codec features audio capture within 50ms, ensuring that voice commands are not clipped, and it encodes audio to the IMA ADPCM standard to maintain high quality over a low bandwidth, low power wireless link. The DA14582 also supports motion sensing for the RCU’s 6-axis sensors.